Soviet Chief Designer 1955-1984 of OKB-52. Leading designer of cruise missiles and ICBMs. Fought for lead role in space launchers and manned spacecraft. Led work on UR-100, UR-200 ICBM's, Proton LV, Raketoplan, Almaz, TKS manned spacecraft. Born: 1914-06-30. Died: 1984-12-08. Birth Place: Sedlets, Ukraine. Chief Designer and General Designer 1955-1984 of OKB-52.. Led work on cruise missiles, ICBMs, and spacecraft. Chelomei was born on 30 June 1914 in the small Ukrainian city of Sedlets into a family of teachers. When he was three months old the family moved to Paltava due to the start of the first World War. In Paltava Chelomei was nurtured and influenced by intellectual neighbors � most importantly Sofia Nikolayeva Danilevskaya, who was the daughter of Gogol and great grand-daughter of Pushkin. When Chelomei was 12 years old the family moved to Kiev. There he studied auto mechanics. 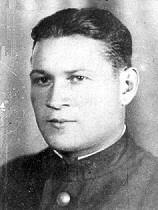 In 1932 Chelomei entered the Kiev Polytechnic, the same school Korolev had attended eight years earlier. Chelomei was a prodigy, a brilliant student. The instructors noted that where Korolev was hyper-active and in love with aircraft, Chelomei was quiet and analytical. At age 22 Chelomei published his first book, Vector Analysis. By the age of 24 he had published 14 papers. He completed his candidate dissertation in 1939. In 1940 he received one of 50 Stalin Scholarships issued annually. In 1941 he joined the Communist Party, completed his doctoral dissertation, and was named Chief of the Jet Engine Group at the P I Baranov Central Institute of Aviation Propulsion (TsIAM). Chelomei independently invented the pulse jet engine in 1942. With support of Aviation Minister Volikov, Chelomei was allowed to form a small research group to develop the technology. As group leader he put the name �Professor Chelomei' on his office door. This created a minor scandal since he had not yet been awarded his doctorate. Chelomei's group managed to build an extremely noisy prototype pulse-jet but the performance was disappointing. Chelomei was called to the Kremlin by Malenkov on 14 June 1944 to see the remains of a V-1 provided by Britain. Marshall of Aviation Novikov was charmed by the engineer and he was tasked with duplicating the V-1 for the Soviet Union. By the end of 1944 he had duplicated the V-1 pulse jet, and by spring of 1945 was conducting first tests of the 10-Kh missile. The pulse jet unit was demonstrated mounted to an La-11 fighter at the Tushino Air Show in 1947. Meanwhile development of the 10Kh continued, with prototypes launched from both ramps and Pe-8 carrier aircraft from at test center at Dzhizkaz in Uzbekistan (well before Kapustin Yar). Unlike the V-2 work of Korolev and Glushko, this was all accomplished without German assistance. Chelomei was given his own design bureau on 17 September 1949 (incorporating part of Polikarpov's old bureau). Chelomei's bureau was seized from him due to various political intrigues (Chief Minister Mikoyan wanted his brother's MiG bureau to handle Soviet cruise missiles, and Secret Police Chief Beria wanted his son to design the guidance). In 1952 Chelomei became a professor at the Baumann University (MVTU), where he specialized in machine dynamics, vibration theory, dynamic stability of elastics, and servomechanism theory. After the deaths of Stalin and Beria in 1953, Malenkov remembered the talented Chelomei. Chelomei had conceived a fantastic new scheme -- winged jet-propelled anti-ship missiles that could be launched from submarines or small vessels. This seemed to the new Soviet leadership to be a revolutionary means of countering American naval dominance. Malenkov arranged for Chelomei to take over a small mechanical factory in Reutov and set him to work developing a new generation of naval cruise missiles. Beginning in the late 1950's, Chelomei began studying use of his encapsulated cruise missile technology for spacecraft. A whole family of unmanned spacecraft, dubbed Kosmoplans, would be built using modular elements. These would include highly maneuverable high performance storable liquid propellant engine modules; nuclear reactor modules for high power space applications; ion engine units for inter-orbital transfer and interplanetary flight; and re-entry vehicles permitting return of payloads from space with landing at conventional airfields. Development of the P-5 cruise missile had not yet been completed before Chelomei sought a massive expansion of his design bureau's work into other areas. It was apparent that for strike against fixed targets the ballistic missile, for which no defense could be developed for decades, would win out over the cruise missile as a weapon system. Furthermore intercontinental ballistic missiles opened up the possibility of the exploration and colonization of space. Chelomei was anxious to be involved in the much more exciting arena of space flight. 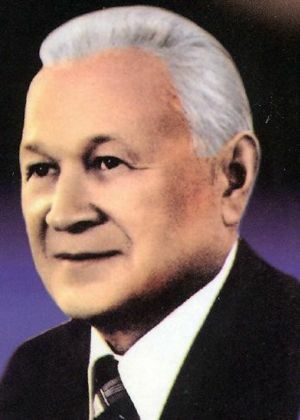 When Korolev's R-7 experienced a long string of launch failures in the summer of 1957, Chelomei was quick to criticize Korolev and asked to be put in charge of the development. But the decisive event in Chelomei's career was a meeting with Khrushchev in early 1958 and his subsequent hiring of Nikita Khrushchev's son, Sergei, on March 8, 1958. This gave Chelomei sudden and immediate access to the highest possible patron in the hierarchy. Chelomei's innovative approaches for standardization and mass production of cruise missiles, ballistic missiles, and spacecraft were in complete accord with Khrushchev's plans to and reduce the size and expense of the Soviet military through the use of revolutionary new technology. With Khrushchev's support Chelomei's bureau grew quickly through consolidation of other bureaus and factories dissolved in the Khrushchev defense downsizing. In 1959 Chelomei was given the elite title of General Designer of OKB-52. The Myasishchev, Lavochkin, and Tsybin aviation design bureaus were wound up and incorporated into Chelomei's. The plumb acquisition was the Khrunichev factory that had earlier worked on Myasishchev's heavy bombers and the Buran cruise missile, and had one of the highest levels of metallurgical and airframe expertise in the Soviet Union. Have you heard, they're closing the Bolshoi Theatre? It'll became a whorehouse for OKB Chelomei. Under Chelomei's direction the P-5 and P-6 (SS-N-3 Shaddock) naval cruise missile was being developed. These missiles were made for long-term storage in environmentally-controlled capsules aboard Soviet warships. Chelomei saw that this technology could be applied to ballistic missiles and spacecraft as well. Chelomei proposed use of this container approach for the UR-100 light ICBM, the Soviet answer to the US Minuteman. This most numerous of Russian ICBM's was a sealed unit, which could be stored fuelled for ten years before being fired within three minutes of launch command. These re-entry vehicles were of unique concept and consisted of a high-fineness oblique conical heat shield with petal-like maneuvering flaps at the base. These were capable of very large cross-range maneuvers (up to 3000 km) at hypersonic speed as well as controlled re-entry at very high velocities from planetary return trajectories. The external shell enclosed an adaptation of Chelomei's naval cruise missiles, a cylindrical fuselage with snap-out wings and a cruise turbojet. After re-entry, the conical shield would explosively separate at Mach 2. The internal craft would deploy its wings and turbojet air inlet, start its engine, and then cruise to a radio-guided precision landing at an airfield on Soviet territory. This approach eliminated the very difficult hot structure problems encountered by other chief designers in their spaceplane designs of the same period. Since the hot heat shield would be jettisoned, the contents did not have to be designed to handle thermal equilibrium temperatures of 400 degrees or more. The same vehicle could also deliver a larger payload under a parachute, or a nuclear warhead. Kosmoplans were to be launched by Chelomei's equally modular family of 'UR' universal rockets, capable of both ICBM and space launch missions. Chelomei proposed variants of Kosmoplans for studies of the earth's upper atmosphere, television communications, meteorology, military photo-reconnaissance, naval radar and signals reconnaissance, and interception and destruction of enemy satellites. Civilian Kosmoplans would engage in exploration of near earth space and the planets. The same modular principles but larger re-entry vehicles would be used for manned interceptor combat Raketoplans. While the UR-200 rocket would be used for launch of smaller earth orbital Kosmoplans, a cluster of UR-200's would create the much larger UR-500 launch vehicle. The UR-500 would be used for launch of manned, lunar landing, and interplanetary Kosmoplan / Raketoplan designs. In 1959, as Chelomei laid out these plans, he knew a tremendous struggle would be required to wrest a piece of the space program from Chief Designer Korolev. The opening shot was contained in a letter sent by Korolev to the Central Committee of the Communist Part in January 1960. Korolev proposed an aggressive program for Communist conquest of space - entirely by Korolev's OKB. He pledged to place before the Central Committee in the third quarter of 1960 comprehensive plans for development of the new projects. This letter was followed by a meeting with Khrushchev on the subject on 3 March 1960. Korolev believed it would be truly possible with backing from the very top to have a large rocket in the USSR in a very short span of time. Unfortunately at the meeting Korolev made a slip of the tongue he would always regret, admitting that his plan had not been agreed among all of the Chief Designers. This resulted in Khrushchev throwing the matter back for a consensus plan. Theme K - Development of unpiloted Kosmoplans for flight to Mars and Venus with return to earth and landing at conventional airfields. These would use new exotic chemical systems, low thrust nuclear engines (nuclear-plasma, ion, atomic hydrogen). The preferred variant consisted of the Kosmoplan re-entry vehicle + equipment section + ion engines on booms + nuclear reactor. Sub-variants with a total mass of 10 to 12 metric tons and 25 metric tons would be developed in 1965-1966. Draft project to be completed in 1962. This authority extended to design of combat orbital Kosmoplans with nuclear warheads for maneuvering re-entry after launch by GR-1 (UR-200) or GR-2 (UR-500) rockets. These would use the re-entry vehicle without the air-breathing lander + the liquid propulsion module. Development of a 600 metric ton gross lift-off mass rocket using new chemical propellants for sending spacecraft to nearby planets. Draft project to be completed in 1962. This would become the UR-500 Proton booster. But it is likely that the actual primary purpose of this rocket is also not mentioned in the declassified document. The Proton was originally designed for the GR-2 (Global Rocket 2) requirement. The GR-2 was to be a kind of enormous multiple-warhead FOBS (fractional orbit bombing system). The payload of the rocket was to be six independently maneuvering nuclear armed vehicles. Each vehicle had a 1,500 kg 2.2 MT nuclear warhead. They would separate from the final stage, and make violent maneuvers using independent guidance systems to put each warhead in a different low 160 km altitude orbit. At the end of a 10,000 to 12,000 km journey along their separate orbital paths, the warheads would appear on US radar screens at the last moment with minimal warning. The total spread of the warheads would be 1800 km from left to right; two such global rockets could devastate America's major cities from coast to coast in an unstoppable first strike. The Kosmoplan re-entry vehicle would use aerodynamic horizontal and vertical maneuvering to penetrate enemy space defenses and be practically invulnerable. Theme R - Manned Raketoplan spacecraft for orbital maneuvering flight and recovery at conventional airfields. Total mass to be 10 to 12 metric tons, total gliding range during re-entry 2,500 to 3,000 km. Unpiloted version to be developed in 1960 to 1961, followed by piloted version in 1963 to 1965. Satellite interceptor operational version to be tested in 1962 to 1964. Theme US - Upravlenniye Sputnik - Naval reconnaissance satellite using P6 nuclear reactor. To be developed in 1962 to 1964. This variant use an active radar system to track American warships and would consist of the Kosmoplan nuclear reactor + equipment module + specialized radar equipment. This Kosmoplan variants went into service, but late to schedule. Theme IS - Istrebitel Sputnik - Anti-satellites - the Ministry of Defense was to decide by July 1960 whether to develop an R-7 launched system for annihilation of enemy reconnaissance satellites. Chelomei was later authorized to proceed with this project. The Chelomei IS ASAT would use the Kosmoplan maneuvering bus and be the first variant to fly. He planned for launch of the production model on the UR-200. But this was cancelled and production ASAT's flew in the late 1960's, launched by Yangel Tsiklon rockets. Chelomei was authorized by Decree 715-296 of 23 June 1960 'On the Production of Various Launch Vehicles, Satellites, Spacecraft for the Military Space Forces in 1960-1967' to complete a draft project on unpiloted Kosmoplans. Chelomei managed a first flight test of a subscale unpiloted version of the Kosmoplan / Raketoplan re-entry vehicle on 21 March 1961. The Kosmoplan's UR-200 (8K81) launch vehicle was approved for production on 16 March and 1 August 1961 by the Central Committee and Politburo. The UR-200 was designed not only to send a thermonuclear warhead over a range of 12,000 km, but also to orbit all of the Kosmoplan military variants: the IS ASAT; the US nuclear-powered naval intelligence satellite; and the Kosmoplan combat re-entry vehicle. The Kosmoplan and UR-200 draft projects were completed in July 1962. The rocket's technical characteristics would be similar to those of Korolev's R-9 and Yangel's R-16. Trial flights of the ICBM version ran from 4 November 1963 to 20 October 1964. Approval to proceed with the UR-500 (8K82) was provided in the Central Committee decree of 24 April 1962. The draft project UR-500 was completed in 1963. The fundamental technological problems of the project had been solved by the end of 1964. In the early fall of that year, Khrushchev and the political leadership of the country visited Baikonur. Chelomei with great pride guided Khrushchev around a dummy UR-500 installed in its launch gantry at the new launch complex, presented the heavy transporters for the launch vehicle and showed a scale model of the launch silo planned for the combat version. Khrushchev's comment was 'what should we build - communism or silos for the UR-500?" It was clear that Khrushchev was not very supportive of the military version of the UR-500. On October 13, 1964, Khrushchev was ousted from power by a retrograde clique headed by Brezhnev. Chelomei had made a critical error of slighting Ustinov, Chairman of the Military-Industrial Commission, when riding high with Khrushchev's backing. Under Brezhnev Ustinov was elevated to the position of Secretary to the Central Committee of the Communist Party for Defense and Space. Furthermore Ustinov idolized Stalin and despised Khrushchev for having torn down Stalin's memory. The new leadership was adverse to all projects Khrushchev had supported. These included those of Chelomei and his OKB-52. An expert commission under Keldysh was directed to examine all of Chelomei's projects and make recommendations as to which should be cancelled. Keldysh found that Yangel's R-36 universal rocket and fractional orbital bombing system was superior to Chelomei's UR-200 / Kosmoplan combat re-entry vehicle. The UR-200 and Kosmoplan were accordingly cancelled. The IS and US Kosmoplans were assigned to KB Arsenal and redesigned for launch by the R-36. The UR-500 development was continued, but only in the 8K82K space launch version for sending the sole surviving Raketoplan, the LK-1 manned circumlunar spacecraft, around the moon. The LK-1 was in turn cancelled in late 1965 as Korolev finally regained control of all manned lunar projects. However Chelomei was not finished yet. His UR-100 was the backbone of the Soviet strategic deterrent. His naval cruise missiles were the only Soviet counterweight to the US Navy. Chelomei received some cover from Ustinov's direct wrath by having his bureau placed under Afanasyev's MOM (Ministry of General Machine Building). Although Afanasyev didn't show any preference to Chelomei over Korolev or Yangel, Chelomei was able to obtain support in the hierarchy from Deputy Minister of Defense Andrei Grechko. Fighting constant resistance, Chelomei was able to proceed with his Almaz military space station and TKS manned ferry. His alternate proposals for manned moon landings (LK-700), Mars missions (MK-700), reusable shuttle craft (LKS) were all rejected by the leadership (although often technically and objectively superior to the selected designs from other bureaus). Soon after Phase 2 of the Almaz was approved in January 1976 Marshal Grechko suffered a heart attack. With this Chelomei lost his most active patron and was unable to withstand the slow strangulation of his projects by Ustinov and Glushko. Ustinov was finally able to cancel the entire remaining Almaz program on 19 December 1981. Manned flights of the TKS were cancelled, and work on the Almaz-T was halted. Ustinov officially wanted Chelomei's TsKBM to concentrate on ICBM development. Chelomei hid the three Almaz-T and OPS-4 space stations in a corner of his factory, labeling them as 'radioactive material'. Chelomei nevertheless persevered. He was still in good health when he suffered a bizarre accident at his dacha in December 1984. While closing the garage door, his Mercedes slipped into gear and crushed him. At first it seemed nothing more serious than a badly broken leg. Chelomei was taken to the Moscow district hospital closest to his dacha. While in the hospital he heard that Ustinov was on his death bed. Even at this stage Chelomei dreamed of a renaissance in his design bureau and was making big plans for future space missions. Then, while on the telephone with his wife, he died suddenly of a massive thrombosis. Chelomei was named a corresponding member of the Academy of Sciences in 1958 and a full Academician in 1962. He was named a corresponding member of the International Astronautics Academy in 1974. Chelomei was a deputy to the 9th and 10th Soviets, received the Lenin prize in 1959, State Prizes of the USSR in 1967, 1974, and 1982, as well as four orders of Lenin, the order of the October Revolution, the Zhukovskiy Medal for outstanding contributions to aviation theory in 1974, the Lyapunov Medal for outstanding contribution to mathematics and mechanics. Twice Hero of Socialist Labor (1959, 1963). Chelomei bureau Russian manufacturer of cruise missiles, ballistic missiles, space launch vehicles, spacecraft, and rocket engines. Located in Reutov, Russia. Country: Russia, Ukraine. Launch Vehicles: Proton. Projects: Lunar L1. Agency: Chelomei bureau. Bibliography: 443, 5256. 1914 June 30 - . Birth of Vladimir Nikolayevich Chelomei - . Nation: Russia, Ukraine. Related Persons: Chelomei. Soviet Chief Designer 1955-1984 of OKB-52. Leading designer of cruise missiles and ICBMs. Fought for lead role in space launchers and manned spacecraft. Led work on UR-100, UR-200 ICBM's, Proton LV, Raketoplan, Almaz, TKS manned spacecraft..
1954 June 9 - . Chelomei put in charge of special design group 10. - . Nation: Russia. Related Persons: Chelomei. Ministry of Aviation Industry (MAP) Decree 'On establishment of Special Design Group 10 at Plant No. 500 at Tushino under V. N. Chelomei' was issued..
1958 March 8 - . Chelomei's bureau acquires GSNII-642. - . Nation: Russia. Related Persons: Chelomei, Khrushchev. Spacecraft: Kosmoplan. Ministry of Aviation Industry (MAP) Decree 293-140 'On subordinating GSNII-642 to OKB-52' was issued. On the same day Chelomei hired Nikita Khrushchev's son, Sergei, to work as an engineer in his design bureau. This gave Chelomei sudden and immediate access to the highest possible patron in the hierarchy. He was rewarded with his own design bureau, OKB-52, in 1959. This would lead to Chelomei being a key figure in the Soviet space program, even after Khruschev's ouster in 1964. 1959 During the Year - . Kosmoplans proposed by Chelomei. - . Nation: Russia. Related Persons: Chelomei. Spacecraft: Kosmoplan. Chelomei began studying use of his encapsulated cruise missile technology for spacecraft. A whole family of unmanned spacecraft, dubbed Kosmoplans, would be built using modular elements. These would include highly manoeuvrable high performance storable liquid propellant engine modules; nuclear reactor modules for high power space applications; ion engine units for inter-orbital transfer and interplanetary flight; and re-entry vehicles permitting return of payloads from space with landing at conventional airfields. PKA Spaceplane Draft Project Completed - . Nation: Russia. Related Persons: Chelomei, Myasishchev, Tsybin. Spacecraft Bus: VKA. Spacecraft: PKA. The Tsybin bureau was closed down shortly after the draft project was completed. Tsybin and his staff transferred to the Myasishchev bureau in October 1959 (which had its own on-going VKA-23 winged spacecraft project). The Myasishchev bureau was then in turn closed and the staff transferred to Filial 1 of Chelomei's OKB-52 bureau in 1960. Tsybin's work on the PKA was passed to the Mikoyan bureau and formed the starting point for the design of the Spiral spaceplane. April 1960 - . Launch Vehicle: UR-200. Chelomei plan for Organic Space System. - . Nation: Russia. Related Persons: Chelomei, Dementiev, Khrushchev, Myasishchev. Spacecraft: Raketoplan. Chelomei visits Khrushchev in the Crimea and presents his ambitious plan for an Organic Space System - a space infrastructure serviced by an integrated family of launch vehicles and spacecraft. The system would include orbiting stations, space factories, winged rockets, and nuclear weapons stored in space with plenty of decoys to defeat any enemy counter-measures. UR-200 rockets would fulfil all roles in servicing this array of weapons. Dementiev supported Chelomei's proposals, but the chief designer would need a factory to support fabrication of the rockets and spacecraft. Myasishchev's bureau and its associated Khrunichev factory were an obvious choice, since the decision had been taken not to put the M-50 bomber or Buran cruise missile into production and the factory would soon be idle. 1960 October 3 - . Launch Vehicle: UR-200. Chelomei acquires Myasishchev and Khrunichev OKBs. - . Nation: Russia. Related Persons: Chelomei, Myasishchev. Spacecraft: Raketoplan. Central Committee of the Communist Party and Council of Soviet Ministers Decree 1057-434 'On transfer of OKB-23 as Branch No. I of OKB-52 and on course of work on IS anti-satellite system' was issued. Chelomei acquired the OKB-23 of Vladimir Mikhailovich Myasishchev, (which had formerly designed heavy bombers), as well as the M K Khrunichev heavy aviation factory. Both of these organisations had a very high level of technical and manufacturing expertise, and assisted Chelomei in quickly moving ahead on his new space projects. 1960 November 1 - . Chelomei R winged manned spacecraft project starts - . Nation: Russia. Related Persons: Chelomei, Myasishchev, Tsybin. Class: Manned. Type: Manned spaceplane. Spacecraft: Raketoplan, SAINT, SAINT II. Immediately after cancellation of similar projects at Myasishchev and Tsybin bureaus, Chelomei's new bureau is assigned to build equivalent of US Dynasoar / Saint II. Winged manned spacecraft for interception, inspection, and destruction of US satellites up to 290 km altitude. Two man crew, 24 hour mission duration, large aft drag brakes. 1961 March - . Launch Vehicle: RS. RS project cancelled - . Nation: Russia. Related Persons: Chelomei, Korolev, Tsybin. Tsybin's design bureau had been taken over by Chelomei, and work on the RS was stopped in the spring of 1961, with three airframes nearly finished. Tsybin went to work for Korolev at OKB-1..
1961 May 13 - . Launch Vehicle: N1. Soviet response to Apollo program - . Nation: Russia. Related Persons: Chelomei. Spacecraft: Elektron-A, Elektron-B, Kosmoplan, LK-1, Raketoplan. 1961 August 15 - . Launch Vehicle: Proton. Chelomei begins UR-500 Proton design studies. - . Nation: Russia. Related Persons: Chelomei. Manufacturer: Chelomei bureau. Program: GR-2. At first the launch vehicle was simply to consist of 4 two-stage UR-200 rockets lashed together, the first and second stages working in parallel in clusters. A third stage would be modified from the UR-200 second stage. However study of this configuration, which included manufacturing of a dynamic test article, indicated that the payload capacity could not meet the military's requirements. 1961 November - . Launch Vehicle: Proton. Preliminary design work by Chelomei on UR-500 (Proton) rocket. - . Nation: Russia. 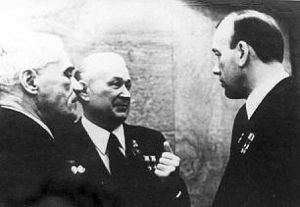 Related Persons: Chelomei, Glushko, Korolev. OKB-52 began to collaborate with V P Glushko's OKB-456 in developing an appropriate engine. Glushko had completed a storable liquid engine design of 150 tonnes for use in Korolev's N1. However Korolev refused to accept this design, due to his refusal to use toxic propellants in his rockets and his belief that such propellants could never deliver the required specific impulse. UR-700 launch vehicle for manned lunar landing missions. - . Nation: Russia. Related Persons: Chelomei. Spacecraft Bus: TKS. Spacecraft: LK-700. 1962 November 1 - . Launch Vehicle: N1. Chelomei takes over Lavochkin and Myasishchev OKBs - . Nation: Russia. Related Persons: Chelomei, Khrushchev, Lavochkin, Myasishchev. Program: Lunar L1. Class: Manned. Type: Manned spacecraft. Spacecraft Bus: Soyuz. Spacecraft: Soyuz 7K-L1. At Khrushchev's decision Chelomei takes over Lavochkin's OKB-301 and Myasishchev's OKB-23. Lavochkin had built objects 205, 207, 400 (SA-1,2,5); Chelomei UR-96 ABM-1..
1963 During the Year - . Space Television Reconnaissance System (TGR) - . Nation: Russia. Related Persons: Chelomei. Spacecraft: TGR. Chelomei began project work in 1963 on a Space Television Reconnaissance System (TGR). The television apparatus was developed by VNII-380 GKRE (I A Rosselevich) and TsNII Kometa MRP (A I Savin). Savin had developed the original draft project, but Chelomei was given overall control. But the project had no sound scientific research basis at that point - it was not advanced enough for a draft project. Work was abandoned and no such system would be put into operation until the Yantar 4KS1 of the 1980's. 1963 March 7 - . LV Family: R-7. Launch Vehicle: Soyuz 11A511. Korolev approves draft plan for 'Soyuz Complex' - . Nation: Russia. Related Persons: Chelomei, Korolev. Program: Lunar L1. Class: Manned. Type: Manned spacecraft. Spacecraft: Soyuz 7K-OK, Soyuz A, Soyuz B, Soyuz V.
1963 March 21 - . LV Family: N1. Launch Vehicle: N1 1964. Presidium of Inter-institution Soviet - . Nation: Russia. Related Persons: Chelomei, Glushko, Keldysh, Korolev. Program: Soyuz. Spacecraft: Soyuz 7K-OK, Soyuz A, Soyuz B, Soyuz V.
The expert commission report on Soyuz is reviewed by the Chief Designers from 10:00 to 14:00. The primary objective of the Soyuz project is to develop the technology for docking in orbit. This will allow the spacecraft to make flights of many months duration and allow manned flyby of the moon. Using docking of 70 tonne components launched by the N1 booster will allow manned flight to the Moon, Venus, and Mars. Keldysh, Chelomei and Glushko all support the main objective of Soyuz, to obtain and perfect docking technology. But Chelomei and Glushko warn of the unknowns of the project. Korolev agrees with the assessment that not all the components of the system - the 7K, 9K, and 11K spacecraft - will fly by the end of 1964. But he does argue that the first 7K will fly in 1964, and the first manned 7K flight will come in 1965. 1963 November 1 - . 08:56 GMT - . Launch Site: Baikonur. Launch Complex: Baikonur LC31. LV Family: R-7. Launch Vehicle: Sputnik 11A59. Polet 1; Polyot 1 - . Payload: I-2B s/n 1. Mass: 1,400 kg (3,000 lb). Nation: Russia. Related Persons: Chelomei. Agency: Korolev bureau. Class: Military. Type: Anti-satellite system. Spacecraft Bus: Kosmoplan. Spacecraft: Polyot. Decay Date: 1982-10-16 . USAF Sat Cat: 683 . COSPAR: 1963-043A. Apogee: 1,420 km (880 mi). Perigee: 331 km (205 mi). Inclination: 58.90 deg. Period: 102.40 min. ASAT interceptor control and propulsion test. Launched by Korolev R-7 because Chelomei's own UR-200 was not yet available. Purpose - elaboration of system providing for the extensive manoeuvring of space apparatuses. Flight was considered a great success. Micro-engine fired 350 times and main stabilizing engine fired 300 times. Orbit given is final orbit after manoeuvres. 1964 June 18 - . USSR five-year military space plan issued. - . Nation: Russia. Related Persons: Chelomei, Malinovskiy. Spacecraft: MiG 105-11, Raketoplan, Soyuz R, Spiral OS, US-A, US-P, Zenit-2M satellite, Zenit-4M. Ministry of Defence Decree 'On military space programs for 1964-69, including the R spaceplane' was issued. The decree was issued by Defence Ministry Marshal Rodiono Yakovlevich Malinovksiy. Included in this plan were new versions of the automatic Zenit, Morya-1 (US series) spacecraft, the Spiral spaceplane, the Soyuz-R manned combat spacecraft, and others. Chelomei's Raketoplan spaceplane was cancelled. 1964 October 12 - . LV Family: Proton. Launch Vehicle: Proton-K.
Almaz project starts - . Nation: Russia. Related Persons: Chelomei. Spacecraft: Almaz APOS, Soyuz R.
The day before the overthrow of his patron, Chelomei obtained permission to begin development of a larger military space station, the Almaz. This 20 tonne station would take three cosmonauts to orbit in a single launch of his UR-500K Proton rocket. Therefore there were now two competing projects for the same mission - Almaz and Soyuz-R. First flight of the Almaz, with a one year operational period, was set for 1968. 1965 March 1 - . Soyuz 7K-PPK cancelled. - . Nation: Russia. Related Persons: Chelomei. Program: Almaz. Class: Manned. Type: Manned spacecraft. Spacecraft Bus: Soyuz. Spacecraft: Soyuz PPK. Based on successful test flights of Chelomei's unmanned interceptor-sputnik prototypes (Polyot 1 and 2), the Soyuz 7K-PPK manned interceptor version is cancelled..
1965 June 1 - . Beginning of Project Spiral - . Nation: Russia. Related Persons: Chelomei, Korolev. Class: Manned. Type: Manned spaceplane. Spacecraft Bus: Spiral 50-50. Spacecraft: MiG 105-11. With the cancellation of Chelomei's desultory R spaceplane development, the job is handed to 'the profis' - the fighter design bureaus of MiG and Sukhoi. Both would use an air breathing first stage (the XB-70 clone T-4 in Sukhoi's case, a huge new Tupolev hypersonic aircraft 'to be developed' in MiG's case). Second stage would be a conventional expendable rocket stage which would carry the relatively small Spiral spaceplane into orbit. Korolev had been doing some 'back door' work with MiG in competition to Chelomei's R project for some time (Began with 1962 Mikoyan study '50-50': Hypersonic first stage to Mach 5.5; rocket stage with one man), and immediately proposed tests from atop R-7 rockets as early as 1967. At the time all this was begun Dyna Soar was still an active US program. 1965 July 16 - . 11:16 GMT - . Launch Site: Baikonur. Launch Complex: Baikonur LC81/23. LV Family: Proton. Launch Vehicle: UR-500. Proton 1 - . Payload: N-4 s/n 1. Mass: 8,300 kg (18,200 lb). Nation: Russia. Related Persons: Chelomei. Agency: MOM. Program: Proton. Class: Astronomy. Type: X-ray astronomy satellite. Spacecraft: N-4 . Decay Date: 1965-10-11 . USAF Sat Cat: 1466 . COSPAR: 1965-054A. Apogee: 578 km (359 mi). Perigee: 181 km (112 mi). Inclination: 63.40 deg. Period: 92.20 min. The first launch of the Proton launch vehicle was not without problems. A leak in the oxidiser pipeline resulted in nitrogen tetroxide spilling on electrical wires. The question was: proceed with the launch or abort? Chelomei decided to go ahead, and on 16 July 1965 the first UR-500 successfully launched the Proton 1 satellite. In the first hours after launch specialists from OKB-52 could only receive signals in the first hours that indicated the satellite was 'alive'. However it later functioned normally and provided physics data on ultra-high-energy cosmic particles for 45 days. At the first launch the rocket was called 'Gerkules' (other sources say 'Atlantis'), as indicated by the large symbol on the second stage skin. This name was however was not taken up. 1965 August 16 - . Chelomei's lunar spacecraft attacked - . Nation: Russia. Related Persons: Chelomei, Korolev. Program: Lunar L1. Spacecraft Bus: TKS. Spacecraft: LK-1. Korolev discusses Chelomei's manned lunar flyby spacecraft with Kamanin. The Party ordered Chelomei to have 12 manned circumlunar spacecraft completed during 1966 and the first quarter of 1967. Chelomei has worked on the he project for many years, but his bureau has not yet decided on a single firm design for the spacecraft, let alone start construction. 1965 September 8 - . LV Family: Proton. Launch Vehicle: Proton-K/D. Development of four stage version of the Proton proposed. - . Nation: Russia. Related Persons: Chelomei, Korolev. The design was proposed by Korolev as an alternate to Chelomei's LK-1 circumlunar mission. It combined the Proton 8K82K booster for the LK-1 with the N1 lunar Block D stage to boost a stripped-down Soyuz 7K-L1 spacecraft around the moon..
1965 October 25 - . Launch Vehicle: Proton. L1 manned circumlunar mission taken from Chelomei, given to Korolev. - . Nation: Russia. Related Persons: Chelomei, Korolev. Spacecraft: LK-1, Soyuz 7K-L1, Soyuz 7K-OK.
Central Committee of the Communist Party and Council of Soviet Ministers Decree 'On the Concentration of Forces of Industrial Design Organisations for the Creation of Rocket-Space Complex Means for Circling the Moon--work on the UR-500K-L1 program' was issued. As a result of a presentation to the Military Industrial Commission, Afanasyev backed Korolev in wresting control of the manned circumlunar project from Chelomei. The Chelomei LK-1 circumlunar spacecraft was cancelled. In its place, Korolev would use a derivative of the Soyuz 7K-OK, the 7K-L1, launched by Chelomei's UR-500K, but with a Block D translunar injection stage from the N1. He envisioned launch of the unmanned 7K-L1 into low earth orbit, followed by launch and docking of a 7K-OK with the 7K-L1. The crew would then transfer to the L1, which would then be boosted toward the moon. This was the original reason for the development of the 7K-OK.
1966 July 27 - . VPK Meeting - L1 delays - . Nation: Russia. Related Persons: Chelomei, Mishin, Severin, Vershinin, Voronin. Program: Lunar L1. Flight: Soyuz 7K-L1 mission 1. Spacecraft Bus: Soyuz. Spacecraft: Soyuz 7K-L1. Marshal Vershinin attends the meeting, where it is revealed that all systems in development - Chelomei's, Mishin's, Voronin's, Severin's, and others - are seriously behind schedule. The first unmanned circumlunar test of the L1 was to be made by 15 April 1967, but it seems unlikely it will even be completed by the end of 1967. 1966 December 24 - . LV Family: Proton. Launch Vehicle: Proton-K.
First session of State Commission for the L1 - . Nation: Russia. Related Persons: Barmin, Chelomei, Mishin, Tyulin. Program: Lunar L1. Flight: Soyuz 7K-L1 mission 1, Soyuz 7K-L1 mission 2, Soyuz 7K-L1 mission 3. Spacecraft: Soyuz 7K-L1, Soyuz 7K-OK.
Tyulin chairs the meeting. Mishin, Chelomei and Barmin brief the status of the spacecraft, booster, and launch site. There is much to be done in order to fly cosmonauts around the moon by 7 November 1967 - the 50th anniversary of the October Revolution. The first manned flight around the moon is planned for 26 June 1967. To achieve this, four flights of the L1 without a crew have to be completed first. The UR-500K booster should be capable of launching the L1 on a direct flight around the Moon and back to the earth. But since the UR-500K has not yet flown, and its 19-tonne low earth payload has not bee verified, Mishin plans to follow the podsadka scenario. The UR-500K will place in low earth orbit an L1 without a crew, and then a Soyuz booster will place a manned Soyuz 7K-OK Soyuz in orbit. The Soyuz crew will rendezvous and dock with the L1, and the crew for the circumlunar mission will spacewalk through open space from the 7K-OK into the L1. The spacecraft will then separate. The 7K-OK returns to earth, while the L1 is boosted on a circumlunar trajectory. After 4 to 6 launches of the UR-500K to verify its reliability and payload margins, it should be possible to make the direct flight to the moon on subsequent versions. For the time being it is necessary to develop both versions in parallel. 1966 December 31 - . Second session of the L1 State Commission - . Nation: Russia. Related Persons: Barmin, Chelomei, Mishin, Ryazanskiy, Spitsa, Zakharov. Program: Lunar L1. Flight: Soyuz 7K-L1 mission 1, Soyuz 7K-L1 mission 2, Soyuz 7K-L1 mission 3. Spacecraft Bus: Soyuz. Spacecraft: Soyuz 7K-L1. Mishin, Chelomei and Barmin report that the spacecraft, booster, and launch facilities are ready. The first unmanned launch of the L1 is set for the end of January, with the arrival of the members of state commission at Tyuratam on 10-12 January. The commission then considers reports on improvements needed for command, control, and recovery of manned lunar spacecraft. General Spitsa and Chief Designer Ryazanskiy list needed improvements to tracking and communications stations. These will cost more than 100 million roubles, including 50 million to equipment tracking ships. Tracking stations at Yevpatoria and Ussuriysk will require extensive new equipment for control of lunar spacecraft. Officers from TsNII-30 report on enhancements required for search and recovery forces. Due to the worldwide requirement, this can no longer be handled by the VVS alone - naval, long-range aviation, and communications forces need to be involved. Returning lunar ships will be targeted for landing on Soviet territory, but there is a great probability in the event of guidance problems of a splashdown in the Indian Ocean or a landing in Iran, Pakistan, or India. The VVS only has very limited capability for sea search and rescue. On 21 December Marshal Zakharov split manned spacecraft recovery responsibility between the VVS and VMF. To enable search and recovery of spacecraft at sea or on land outside of Soviet territory will require 12,000 to 15,000 personnel and dozens of ships, aircraft, and helicopters. A new net of ground-based radio stations and direction finders will also be needed. This will cost hundreds of millions of roubles to implement. The cost must be borne - it is clearly unacceptable that a Soviet crew fly to the moon and back, only to perish on return to earth due to inadequate recovery forces. A special subcommittee under Marshal Rudenko is named to handle the matter. Kamanin reports on training plans for lunar spacecraft. Crew training will have to begin in January 1967 for crews to complete the five-month syllabus in time for the planned flight dates. L1 commanders must be pilots with prior spaceflight experience. The second cosmonaut need not have flown before. Training of L1 and 7K-LOK crews must be carried out in parallel and separately in order to meet schedules. Mishin, the Ministry of Public Health, and Kamanin should name the crews for thee flights within five days in order to make schedule. 1967 April 8 - . 09:00 GMT - . Launch Site: Baikonur. Launch Complex: Baikonur LC81/23. LV Family: Proton. Launch Vehicle: Proton-K/D. FAILURE: Block D ullage rocket failure; no restart.. Failed Stage: U.
Cosmos 154 - . Payload: Soyuz 7K-L1P s/n 3P. Mass: 5,020 kg (11,060 lb). Nation: Russia. Related Persons: Chelomei, Mishin, Tsybin. Agency: RVSN. Program: Lunar L1, Soyuz. Class: Manned. Type: Manned spacecraft. Spacecraft Bus: Soyuz. Spacecraft: Soyuz 7K-L1. Duration: 1.98 days. Decay Date: 1967-04-10 . USAF Sat Cat: 2745 . COSPAR: 1967-032A. Apogee: 203 km (126 mi). Perigee: 187 km (116 mi). Inclination: 51.50 deg. Period: 88.30 min. Protoype Soyuz 7K-L1 manned circumlunar spacecraft. There are high winds for the L1 launch, 15-17 m/s. The official limit is 20 m/s, but Chelomei wants to scrub the launch if winds go over 15 m/s. Nevertheless the launch proceeds in 17-18 m/s winds and the L1 reached earth orbit. However the Block D translunar injection stage failed to fire (ullage rockets, which had to fire to settle propellants in tanks before main engine fired, were jettisoned prematurely). The failure is blamed on Mishin and has Tsybin seething in anger. Mishin is disorganised and has made many mistakes. Spacecraft burned up two days later when orbit decayed. Later in the day comes the news the RTS has to be replaced on one of the Soyuz 1/2 spacecraft. This will have a 3 to 4 day schedule impact, and push the launch back to 15-20 April. The crews arrive the same day for the upcoming Soyuz launch. 1967 July 21 - . Launch Vehicle: UR-700. Chelomei signs design documents for UR-700/LK-700 lunar expedition - . Nation: Russia. Related Persons: Chelomei. Spacecraft Bus: TKS. Spacecraft: LK-700. Chelomei's TsKBM began work on the UR-700 launch vehicle for manned lunar landing missions in 1962. Chelomei took a sound conservative design approach (i.e. no docking required, no cryogenics)..
1967 October 7 - . LV Family: Proton. Launch Vehicle: Proton-K.
Soviet of Chief Designers - . Nation: Russia. Related Persons: Chelomei, Dementiev, Glushko, Mishin, Ustinov. Program: Lunar L1, Soyuz. Spacecraft: Soyuz 7K-L1, Soyuz 7K-OK. In Moscow, Mishin heads a meeting of all the Chief Designers (including Chelomei, Mishin, and Glushko). Glushko says that the last UR-500K failure was due to errors made during manufacture of an engine in 1965 at Factory 19 at Perm. Ustinov notes that the failure has cost the state 100 million roubles and has delayed the program two to three months. He brutally attacks Dementiev, Minister of Aviation Industry, for the poor work of his factories on the space program. Another issue is continued delays in the Salyut computer for the L1. Ustinov orders an alternate technical solution to be developed in parallel with the digital computer development. The next Soyuz flight is set for the end of December, the next L1 attempt for 21-22 November. 1967 November 22 - . 19:07 GMT - . Launch Site: Baikonur. Launch Complex: Baikonur LC81/24. LV Family: Proton. Launch Vehicle: Proton-K/D. FAILURE: Second stage - 1 x RD-0210 failure, shutoff of stage 4 seconds after ignition. Launcher crashed downrange.. Failed Stage: 2. Soyuz 7K-L1 s/n 5S - . Payload: Soyuz 7K-L1 s/n 5L. Mass: 5,390 kg (11,880 lb). Nation: Russia. Related Persons: Chelomei, Glushko, Leonov, Mishin. Agency: RVSN. Program: Lunar L1. Class: Manned. Type: Manned spacecraft. Spacecraft Bus: Soyuz. Spacecraft: Soyuz 7K-L1. Decay Date: 1967-11-21 . 1968 February 29 - . LV Family: Proton. Launch Vehicle: Proton-K/D. L1 commsision meeting. - . Nation: Russia. Related Persons: Chelomei. Program: Lunar L1. Spacecraft Bus: Soyuz. Spacecraft: Soyuz 7K-L1. For this L1 launch Chelomei wants to film separation of the first and second stages of the Proton rocket at 126 seconds into the flight - altitude 41 km, distance downrange 47 km. To do this two An-12 and one Tu-124 with long focal-length cameras will orbit 35 to 40 km from base. The discussion turns to how to recover the L1 if it lands in the ice-bound Aral Sea. The circle of possible landing points has a radius of 500 km from a point west of Karaganda. For political reasons it is not possible to deploy recovery forces to areas of Iran and India that are within this circle. 1969 late February - . Launch Vehicle: UR-900. UR-900 launch vehicle proposed - . Nation: Russia. Related Persons: Chelomei. 1969 July 30 - . Launch Vehicle: UR-700M. Soviet manned Mars spacecraft study - . Nation: Russia. Related Persons: Chelomei. Spacecraft: Aelita satellite, MK-700. 1969 August 9 - . LV Family: N1. N1M to launch expeditions to the moon, Mars, and MKBS. - . Related Persons: Mishin, Keldysh, Ustinov, Chelomei, . Spacecraft: , MKBS. "Luch" - you need to develop (especially realistic anti-jamming measures). NA Pilyugin - against the N1M LV. 1970 February 16 - . LV Family: N1. Next five year plan emphasized the use of the N1 - . Related Persons: Mishin, Chelomei, . Spacecraft: Soyuz, MKBS, Almaz, Salyut, LK. Topaz - 750 (unknown code name). 26. On the draft resolution for the MKBS. 1. Use the same cooperation established in the design and manufacture of DOS. 2. Expand the cooperation of developers in various departments (especially on power, life support systems, equipment for national economic and scientific purposes). 2. Create the necessary experimental and industrial base (with the planned cooperation of developers). 3. Select TsKBEM factory for serial instrument production with MOM. 4. Determine the organization within MOM (former Nikitin) for the development of simulators and control panels. 5. Organize mass production 7K-S at the plant in Omsk (or in the factory "Progress"). 6. Hydrogen blocks Sr and S - TSKBEM factory and plant "Progress". 7. Instruct Affiliate TsKBM (T. Bugajski) development of MKA (shuttle) according to TsKBEM's requirements (an interesting allusion to development of the LKS space shuttle by Chelomei's organization). 8. Determine the parent organization for the production of "Almaz" - organization of Chelomei (Reutov). 1970 June 16 - . LV Family: Proton. Launch Vehicle: Proton-K.
Development of TKS ferry for Almaz authorised. Soyuz 7K-TK cancelled - . Nation: Russia. Related Persons: Chelomei. Spacecraft: Soyuz 7K-TK, TKS. Decree 437-160 'On creation of the TKS and termination of the 7K-TK' was issued. In 1969 Chelomei proposed replacement of the 11F72 Soyuz 7K-TK with his own transport-supply spacecraft 11F72 (transportnovo korablya snabzheniya - TKS). This would consist of the same 11F74 VA landing capsule used on the Almaz station, together with a new 11F77 functional-cargo block (funktsionalno-gruzovovo blok, FGB). This would transport three crew and sufficient supplies for 90 day operation of the Almaz. 1970 October 20 - . LV Family: N1. Lox/LH2 upper stages for the N1 necessary to achieve program - . Related Persons: Mishin, Chelomei, . Spacecraft: , MKBS, MAVR, Almaz, Salyut, LK, L3M. Mishin reviews the work and configurations of the Lox/LH2 (S and Sr) upper stages for the N1 necessary to achieve various programs. Mishin reviews the work and configurations of the Lox/LH2 (S and Sr) upper stages for the N1 necessary to achieve various programs (Mishin Diaries 2-293). Here was see evidence for several previously hinted-at but poorly-documented projects: the Lunar Orbital Station (N1+Almaz), the MAVR manned Mars-Venus-Flyby Spacecraft: AM Isaev - about speeding work on the engine 11D56. AM Lyulka - about speeding work on the engine 11D57. 1. S, Sr - LOS (lunar orbital station?) SNTV satellite for direct TV broadcasting, MAVT (MAVR? ), DOS-II (later Mir). 3. S + S + Sp - L3M, MKBS, Mavr and others. 4. NII - DOS (20t - indecipherable) - this apparently refers to later plans to dump Chelomei's Proton vehicle and go back to the original plan to use the NII (consisting of the second and third stages of the N1) for this earth orbit payload class. 5. N1S => 110 t (the low earth payload for this version of the improved N1). (Mishin Diaries 2-293). 1970 November 18 - . Luna 17 lands on moon. - . Nation: Russia. Related Persons: Chelomei. Program: Luna. Spacecraft: Luna Ye-8. Luna 17 / Lunokhod have landed on the Sea of Storms on the moon. Chelomei is assisting Kamanin in securing funds for the water basin for zero-G training, further simulators, etc..
1971 February 1 - . Salyut shipped to Baikonur - . Nation: Russia. Related Persons: Bugayskiy, Chelomei, Mishin, Semenov. Program: Salyut. Spacecraft Bus: Almaz. Spacecraft: Salyut 1. 1971 September 21 - . LV Family: N1. Crew shuttle to be used with MKBS (Soyuz, 7KS, Chelomei spaceplane, or a new high L/D spacecraft) - . Related Persons: Mishin, Chelomei, Bezverby, . Spacecraft: Soyuz, MKBS, Soyuz 7K-S, Mir, LKS. The issues of the crew shuttle to be used with MKBS (evidently choices are the existing Soyuz, 7KS, Chelomei's spaceplane, or the new high L/D spacecraft) Bezverby VK MKBS-1 on N-1 and variants of crew transport spacecraft (Mishin Diaries 2-362). 1972 During the Year - . Launch Vehicle: UR-700M. Soviet Mars expedition work ends - . Nation: Russia. Related Persons: Chelomei. Spacecraft: MK-700. Chelomei's preliminary draft project for the UR-700M launch vehicle and LK-700 spacecraft was reviewed by a government expert commission. Based on the decades worth of development and tens of billions or roubles required to realise the project, the state commission recommended that further work on manned Mars expeditions be deferred indefinitely. 1975 January 1 - . Launch Vehicle: UR-700. Chelomei presents plan for Mars mission - . Nation: Russia. Related Persons: Chelomei. Class: Mars. Type: Manned Mars flyby. Spacecraft: MK-700. As the only remaining contender for the Aelita design competition, Chelomei proposes a Mars flyby using an MK-700 spacecraft. A crew of two would be sent on a two year mission in a single launch of a UR-700M booster. The spacecraft would have a mass of 250 tonnes in low earth orbit and be equipped with an RD-410 nuclear engine. 1975 April 29 - . LV Family: Proton. Launch Vehicle: UR-500MK. UR-500MK designed - . Nation: Russia. Related Persons: Chelomei, Glushko. In response to the Ministry of Defence's guidelines for third generation launch vehicles, the Ministry of General Machine Building issued instructions for Chelomei to study boosters meeting the military's requirements. These included Lox/Kerosene propellants in place of the toxic N2O4/UDMH favoured previously. Chelomei's competitor in the design, Glushko, was then head of NPO Energia which included Glushko's former OKB-456 engine design bureau. Therefore Chelomei was forced to propose using Kuznetsov Lox/Kerosene engines from the cancelled N1 moon program. The use of existing Proton tankage tooling for the stages and the Kuznetsov engines would allow a high-performance vehicle to be developed at minimum cost. However Chelomei was out of favour, Kuznetsov was discredited after the N1 fiasco, and Glushko was ascendant. The proposal stood no chance. Glushko's Zenit launch vehicle became the accepted solution. 1978 - During the year - . Manned Almaz program terminated - . Nation: Russia. Related Persons: Chelomei, Glushko, Ustinov. Program: Almaz. Class: Manned. Type: Manned space station. Spacecraft: Almaz OPS-2, TKS. Almaz station portion of the project already severely cut back after Marshal Grechko's heart attack in early 1976. Chelomei lost his most active patron and was unable to withstand the slow strangulation of his projects by Ustinov and Glushko. Almaz finally completely scrapped in 1980, but Chelomei hid the completed space stations in a corner of his complex, labelling them as 'radioactive material'. Chelomei finally forced to retire in October 1983. TKS shuttle craft used to dock with Salyut stations but never in manned mode. Following Ustinov's death, Almaz stations finally flown as unmanned radarsats, but Chelomei did not live to see this. Almaz cancelled and consolidated with Mir - . Nation: Russia. Related Persons: Chelomei. Spacecraft: Almaz OPS-2, Mir, TKS. Following the decision to cancel Chelomei's manned Almaz military space station programme, a resolution consolidated the programs, with the Mir docking ports to be reinforced to accommodate 20 tonne space station modules based on Chelomei's TKS manned ferry spacecraft. NPO Energia was made responsible for the overall space station, but subcontracted the work to KB Salyut due to the press of in-house work on Energia, Salyut 7, Soyuz-T, and Progress. The subcontractor began work in the summer of 1979. State commission reviews LKS spaceplane - . Nation: Russia. Related Persons: Chelomei. Spacecraft Bus: OK. Spacecraft: LKS. A State Commission reviewed Chelomei's LKS spaceplane design on behalf of Minister of Defence V M Shabanov. Shabanov was completely opposed to the LKS, and had staged the commission for the express purpose of burying Chelomei's proposal once and for all. Further development of the LKS was stopped. 1984 December 8 - . Death of Vladimir Nikolayevich Chelomei - . Nation: Russia, Ukraine. Related Persons: Chelomei. Soviet Chief Designer 1955-1984 of OKB-52. Leading designer of cruise missiles and ICBMs. Fought for lead role in space launchers and manned spacecraft. Led work on UR-100, UR-200 ICBM's, Proton LV, Raketoplan, Almaz, TKS manned spacecraft..